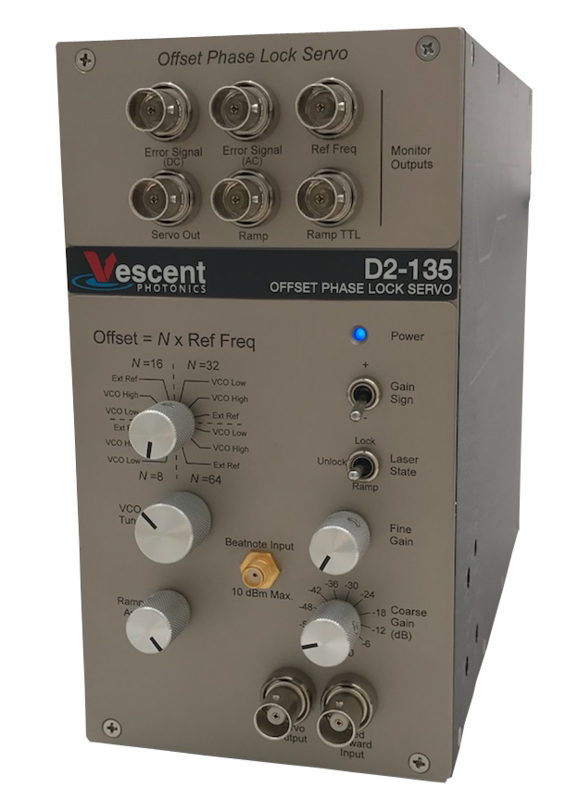 The D2-135 Offset Phase Lock Servo (OPLS) is designed to precisely control and quickly adjust the frequency detuning between two lasers. The D2-135 provides for an extremely tight phase lock between the master and the slave. The D2-250 Heterodyne Module conveniently enables the overlap and fiber coupling of two laser beams. This mates with a FC fiber connector on the D2-135, providing an easy optical input for the beat note. Alternatively, the fiber connector can be exchanged with an SMA to input an electronic beat-note. One can detect the optical beat note with the D2-160, or a third-party high-speed detector. 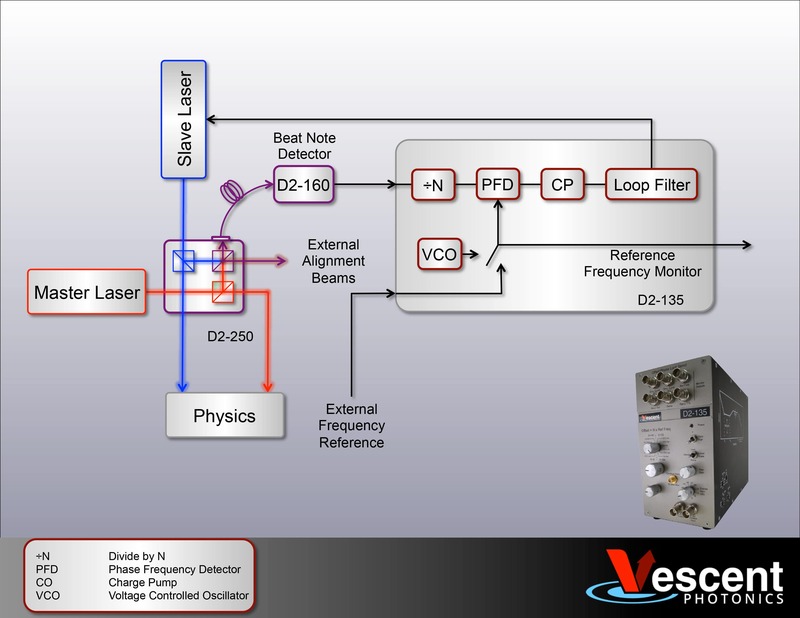 The D2-135 OPLS provides full servo-loop customization for optimization of most lasers. Typical Phase Lock using the D2-135 and two D2-100-DBR lasers. Note x-axis is divided by 2 so that the actual offset is 400 MHz. The D2-135 can incorporate a fast photo detector to accept an optical beat note with 760 nm ≤ λ ≤ 860 nm. The optical beat note is coupled to the detector in a multimode fiber with an SC fiber connection. Alternatively, the D2-135 can be configured to accept an electrical beat note obtained from a stand-alone fast detector, such as the D2-160 or third-party detectors. The D2-135 integrates into our Rackless Rack. As such, it may be powered with our D2-005 or from an adjacent D2 electronics module. If used as a stand-alone product, it may be powered with either a D2-005, or from a user supplied power supply via a breakout board. View a typical configuration for using the D2-135.